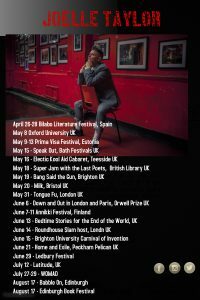 As a part of my research process I have been travelling extensively across the UK and Europe, touring my latest poetry collection Songs My Enemy Taught Me. This is the collection from which the stories in The Night Alphabet will be drawn from, and so it makes sense that I should use this opportunity to travel to speak with women from marginalised communities world wide, and lead as many masterclasses as possible. May 8th– Oxford University. Panel and readings, with Simon Armitage, Bernadine Everisto and Rebecca Watts. Panel discussion: accessibility in poetry. 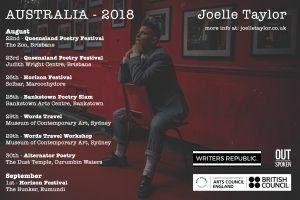 After Australia we will be heading off to Singapore for a week of gigs and workshops – watch this space, and if you’re in the area please do drop in, watch, chat and contribute to The Night Alphabet forum.